A beneficiary practicing zai technique in Koiria Haoussa village, commune of Kourtey in Niger. ©Nafissa Amadou Bagna. Never has there been a more difficult time in the Sahel than now, given the combination of challenges facing the region’s current population of 150 million people. Deep, endemic poverty, a demographic explosion that will see the region’s population double in the next 20 years and violent extremism are creating refugees of millions of people. This sits within the broader environmental framework of a changing climate that is bringing with it more extreme weather events and a long-term change in the sedentary and nomadic farming prospects for the whole region. More than 30 million people suffer food insecurity – a fifth of the region’s population. For farmers in the Sahel, innovating and adapting to variable environmental conditions have been part of life for centuries. 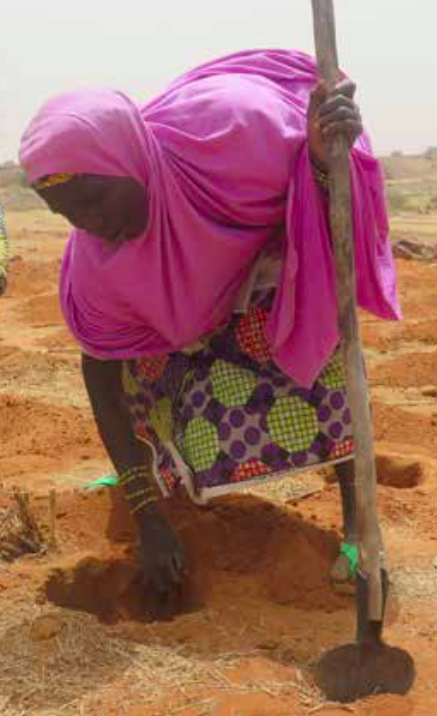 The climate is naturally variable, and much of the Sahel is drought-prone; in the 1970s and 1980s, lower rainfall caused drought and food crisis; higher rainfall in the 1990s improved food security. Land degradation and desertification are ongoing issues. Recent analysis found there had been a significant decline in natural vegetation in the past 40 years in the Sahel, and climate change and increased climate variability are exacerbating this in the short- and long-term. This paper* examines innovative approaches that have been adopted in four BRACED projects to build resilience to current and future climate risks. It discusses the characteristics of climate-resilient innovation in farming, the tracking of innovations across BRACED projects, and how the contributions of innovations to climate resilience can be tracked and measured through pathways of change. Innovation is not the same as invention, although the two are often conflated. An innovation may be a very simple stepwise change to an existing system, or may create a deeply transformational change. This change might be anticipated or unanticipated, planned or experimental. Innovations in agriculture have an inherently political aspect in their development, dissemination, wealth generation and marginalisation. Simply put, ‘Inclusive’ approaches to innovation should be socially inclusive in terms of the process, and the problems and solutions to which they are related. In the BRACED programme, using this ‘inclusive innovation’ approach, we define innovations according to five characteristics of innovation that are important in the informal, dynamic settings of most small farmers. These are shown below. Table 1 from page 8 of the report: Five characteristics of innovation. Adapted from Rogers (2003) and Cozzens and Sutz (2012). Participants discussed the definitions of innovation, and criteria as to how their activities were innovative. They also considered how their activities might be expected to build resilience, and the limitations and opportunities involved in this process. Group and peer learning was integral to this process, and enabled rich discussion around innovations and resilience with the team members involved. Four case studies were produced, outlining the approaches to resilience-building through the innovations highlighted. Innovations in BRACED country case studies (Table 3, page 11 of the paper). Farmers have innovated for centuries, as part of dynamic, informal processes of learning and responding to change. Innovation is central to efforts to encourage both economic growth and social development in rural areas. A grassroots, inclusive ‘innovation’ may have one or more of five characteristics: newness; adaptation from other efforts; collective and socially cohesive interactions; application of new knowledge content; and new or improved learning pathways. Climate-resilient innovation involves integrating what we know about the current and future climate into the design of the innovation so people are more able to anticipate, adapt to or absorb the effects of climate change. Innovations in climate resilience include changing practices (e.g. technical aspects of farm production), economic innovations (e.g. credit access and savings schemes) and social innovations (e.g. participatory planning and access to and integration of climate information by farmers). This paper analyses four BRACED projects that adopt these types of innovations. Measuring how far a specific innovation has strengthened climate resilience is challenging. BRACED measures existing levels of climate resilience and vulnerability, and accompanies innovations as they develop and embed in communities. Further research will investigate these. PRESENCES: Natural resource management and governance, climate-resilient livelihoods and improved climate information services. Countries of operation: Niger. Grist, N. and Harvey, B. (2017) Framing innovations for climate resilience for farmers in the Sahel. BRACED Resilience Intel, issue 9. Building Resilience and Adaptation to Climate Extremes and Disasters (BRACED).